This course is made up of the first half of our long established and highly successful Certificate in Horticulture (VHT002). If you choose, you can upgrade with a further 300 hrs of study following this course; to obtain that qualification. In the UK, Europe and elsewhere. See how gardens have evolved over the centuries, and broaden your perspective on what is possible and appropriate in garden design today. Garden history will enlighten you, and vastly expand the scope of possibilities you have before you as a modern garden designer. Lessons cover garden designers, great gardens and gardeners of the world, private and public gardens, globilisation of gardens, scope and nature of modern garden conservation, the roles of organisations in garden conservation and much more. Lessons covering planning for efficient and economical management in horticulture including such things as: work procedures and programming, budgeting and staff supervision. The course is relevant to all areas of horticulture including nurseries, parks, private gardens, market gardening and fruit production. In any business, including horticulture, success depends upon your ability to successfully market your product - so that you stay ahead of your competitors. This is a comprehensive well-rounded course that offers the horticultural marketing manager or small business owner what they need to be successful in this essential component of business management. This subject covers the theoretical and practical importance of marketing in the horticultural industry including topics such as advertising, promotions, signs, customer relations, pricing strategy, labelling, transport, product presentation and more. Do You have a Passion for Helping Others? And also Passionate about Horticulture? Combine the two for a rewarding career in horticultural therapy. 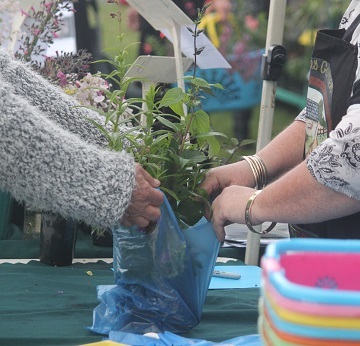 Horticultural therapy (also known as ‘social and therapeutic horticulture’) uses the activities associated with horticulture such as gardening, plant propagation, plant care, visits to natural environments and gardens and parks etc. in personal development; to engender a feeling of well-being, improve physical health and encourage social interaction. The ideal course for the beginner, this is a basic, yet thoroughly practical course which gives you a sound broad technical grounding in horticultural principles and practices. A section of each lesson involves plant identification. Understand the measures that can be taken to counter these issues and repair damaged land. Soil is an important part of the ecosystem with strong interconnections between flora, fauna and microbiological components. It often determines water and air quality and is an important medium used to ‘clean’ or store municipal, domestic, industrial and radioactive waste. Plants equally are important to the stabilsation of soils and health of the planet in general. Learning how to save and improve soil in a sustainable manner is our future. Start your training to work in zoos, national parks or wilderness area management here. Over 15 lessons the student will develop an understanding of the natural environment and basic ecological principles, and learn a variety of skills ranging from basic gardening and nature park design, to erosion control, weed control and tree surgery. This course is a natural progression from Nature Park Management I, but can be taken in its own right. It concentrates more on native plants and using them to create natural, balanced ecosystems. Over 15 lessons you also learn to create nature trails, build rockeries and pathways, construct ponds and watercourses, design picnic grounds and animal enclosures, market a nature park, and lots more. Learn to be a Horticulturalist but with the Best Practical Skills! A practical approach to horticultural education. How do you learn the practical side of horticulture by distance education? Although all ACS courses are practically and well as theoretically focussed - this course was developed for those people who feel that they will gain more from a course that places MOST of the learning experience on learning theory - through practice. Best taken online or on CD - lots of interactive learning tasks included. Take the next step in your career: develop practical skills in the management of a variety of horticultural situations required of the horticultural manager or the management of your own business that you would normally learn working under the supervision of a horticultural expert. A step on from Practical Horticulture 1 but a course that can be taken in its own right by those with fundamental horticultural knowledge. Following is an excerpt from lesson 1. Work planning and project management is an important aspect of the type of work that would be generally carried out by the professional horticulturist. It may be in diverse areas within the horticulture industry i.e. a planting program, plant sales program, landscape project, re-vegetation project, sports or turf management, irrigation and drainage systems implementation, production planning (crops and nursery), conservation of natural resource areas, conserve a heritage area and so on. Project management may be under the broad direction of superiors in certain situations however self directed application of knowledge that has substantial depth is expected at this level. Some supervision is required for this course by an independent horticultural expert such as your work manager or other expert. The course contains all the tips to develop excellent practical skills in the management of a variety of horticultural situations. It covers subject areas such as: horticultural calculations, propagation management, hard and soft landscape management, planning - identifying needs for management of horticultural sites, identifying plant tissue and much more. This course will help you to stay ahead of the competition! For anyone not already involved in horticulture it can give you skills that are all too often lacking in the horticulture workplace to strengthen your career prospects. If you already know how to grow, but are struggling to advance your prospects, this course offers an opportunity to fill the gaps in your knowledge - that may well make a big difference to your future. There are eight units plus a 200 hr workplace project in this course. (A 900 hour course). Management, Office Practices, Marketing and Business Operations, Marketing Foundations. Three stream units (chosen by the student from a list of units) involve another 300 hours of study. A workplace (industry) project relating to some aspect of horticultural technology involves the final 200 hrs of study. This course provides training for people to work in the care and development of gardens, parks, historic properties, private estates, or other areas of amenity horticulture (e.g. street trees, interior plantscaping), at a technician or management level, in positions such as: managers, technical officers, or consultants. This course provides training for people to work in the management and development of recreation and park facilities and services. It is relevant to all types of situations including municipal parks, national parks, tourist parks, resorts, etc. This is a substantial and unique course, requiring a 5 year part time or 2 to 3 year full time commitment. This course provides initial training for gardeners, groundskeepers and others involved in the care and maintenance of parks, gardens and turf facilities. This course is similar to other C12CN002 horticulture certificates in its introductory (core) units, but devotes 50% of the course to topics specifically related to grounds maintenance. The aim of this course is to expand the student's professional opportunities by building knowledge on how to identify, grow, and maintain ornamental plants and gardens in any climate - with emphasis placed on the plant varieties which are horticulturally most valuable. Topics covered include garden maintenance, turf care, arboriculture, landscaping, and nursery work. A 700 hour course that provides initial training for anyone working, or intending to work in ornamental horticulture. This diploma is designed for people with extensive industry experience who wish to fast track a qualification. It does still require the candidate to show sound theoretical knowledge of science and management at an ACS diploma level through examinations. Exam preparation largely involves a mentor guided program of learning. For some candidates this may require minimal effort, and for others, it may be extensive. The mentor will assess and monitor progress to ensure preparation for the exams is appropriate. A Proficiency Award allows you to study subjects in a highly specialised area. You select and study three short courses of your own choice, which relate to each other (e.g. Three crops or three landscaping short courses). In addition, you must complete 200 hrs of approved work experience before receiving the award. Approval of course structure must be obtained before enrolling. Weed control is an important hortictural practice - understanding their characteristics and lifecycles is fundamental to knowing how to control weeds. In horticultural practice, if weeds are to be controlled, it is critical that they are accurately identified when young. However, weeds are notorious for their diversity and resilience. These two characteristics have made weeds attractive as garden plants in countries to which they are not native and help to become noxious plants.